Yesterday’s signals were not triggered, as the bearish price action took place at 0.7140. Long entry following some bullish price action on the H1 time frame immediately upon the next touch of 0.7075. Short entry following some bearish price action on the H1 time frame immediately upon the next touch of 0.7175. I wrote yesterday that it looked as if 0.7140 would be the pivotal level, but there was little else to go by. However, there was definitely a medium-term bearish trend, so overall short trades were likely to produce more profit than long trades. The price did rise after overcoming 0.7140 yesterday, but then fell very strongly during the Asian session, and that fall is continuing even at the time of writing. 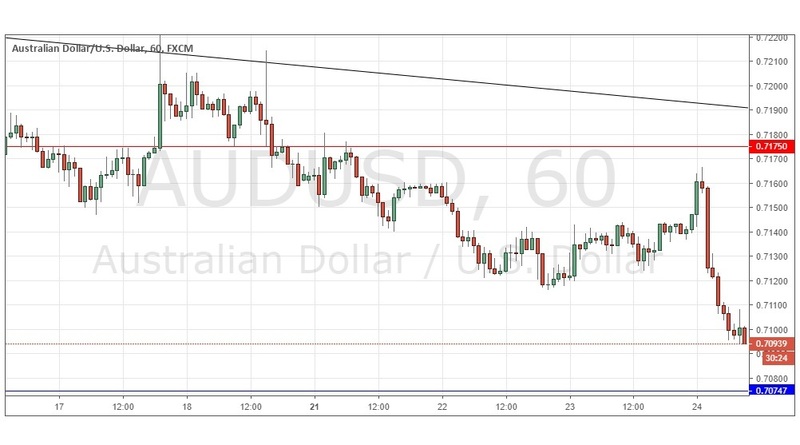 The downwards movement has invalidated the former support level at 0.7100 and it looks as if the bearish momentum will now carry the price down to 0.7075, the next support level. I have a bearish bias until that level is reached, as long as the price continues to make new lows. There is nothing important due regarding the USD. Concerning the AUD, there will be releases of Employment Change and Unemployment Rate data at 12:30am London time.